This entry is a guest post by Vaibhav Kakkar, Co-founder & Chief Growth Officer at RankWatch and NotifyFox. Every question of Tony Stark was preceded with “Why” “How” “What” “Who” followed with a precise information query. The answer was prompt and to the point without any unwanted results or suggestions. This is what was started by Iphone 4S with Siri in 2011 and in present times is replicated by “Ok Google”, “Microsoft Cortana” and “Amazon Echo”. Today, people just ask specific questions instead of typing relevant keywords in search engines. This does not mean that keywords have lost all of their relevance. It is just that with time they probably will. Needless to say e-commerce business owners who want to survive and thrive on online platforms need to cash in on this new phenomenon. “61% of users had adopted intelligent voice assistants in the 12 months prior to October 2015, 44% of users had adopted them in the 12 months prior to January 2016”. It is more convenient than typing and looking for information on search engine. It takes multitasking to altogether new levels. Conversational search enquiry where in user gets reply with precise voice results makes it a tad bit more interesting. 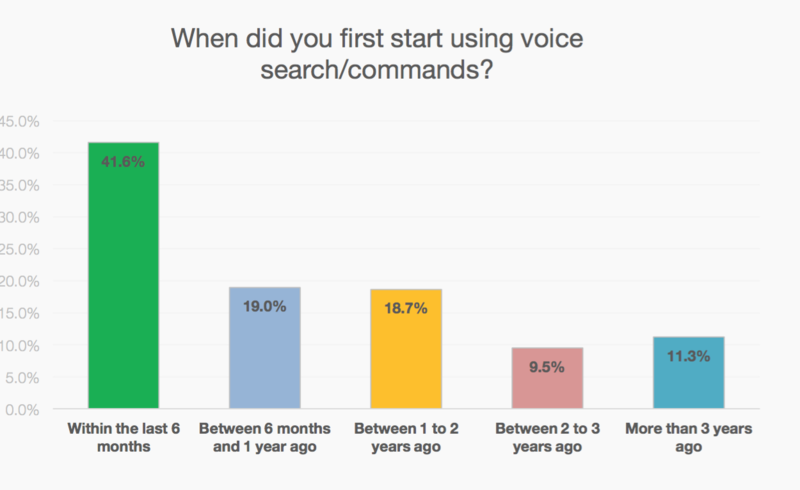 If you are still unsure about the impact and future scope of voice search engine vis-à- vis online audience check out the graph below which highlights the continuous rise in voice search optimization. Optimize your website with long tail keywords. Voice search diminishes the role of keywords which is generally a word or two long. With voice search the approach is more natural and more of a conversation style where in a user asks “how to make black coffee” rather than just search for “black coffee” in search engine. The voice search engine responds to the particular set of information asked by the user and provides with precise set of instructions to make black coffee. Long tail keywords are phrases or a sentence which direct an online user to precise information they are looking for. Long tail keywords take the concept of user friendly search engine to next level. The results provided by long tail keywords are refined. E-commerce business owners can connect with their market audience with much effectiveness compared to keywords. 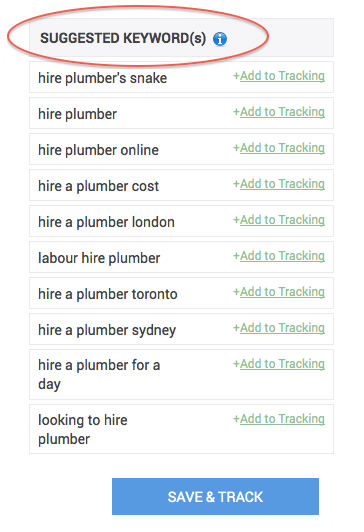 How to optimize with long tail keywords? Say, if you are into clothing business and sell Musician/band t-shirts. With present trend you have to optimize your website content with “band t-shirt” “buy t-shirt” and so forth. Now, when a user uses voice search engine to get hold of Pink Floyd t-shirt they are going to take a more natural approach of asking voice search engine “From where can I buy pink Floyd t-shirt”? The difference in both the approaches is quite visible and long tail keyword here in “buy pink Floyd t-shirt” will assist voice search engine to provide with appropriate results without any co-related search results. You can find long tail keywords pertaining to your e-commerce website with the help of Rank Watch keyword suggestions. You can use Rank Watch which provides with all the relevant long tail keywords by its get keywords ideas search. As is the case with keywords on search engines same applies to long tail keywords on voice search engine. You have to understand voice search engine user’s style and language. On voice search engines the query is preceded with precise set of instructions i.e. “Why” “How” “What” “Who”. Update your website content with a more of natural conversational approach. Avoid keywords that cannot be explained. Use question phrases in the content and provide with answers. Websites today carry a separate FAQ page on their web platform. Those set of questions can be included in website content as a separate page in appropriate context. 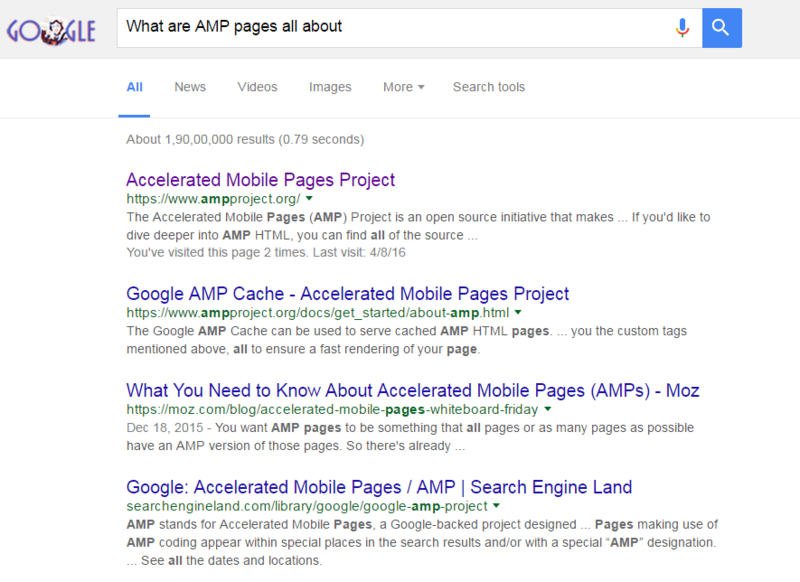 For example: if you search for “what are AMP pages all about?” you are directed to AMP project website which carries a separate FAQ page to answer every question related to AMP pages. As mentioned earlier voice search engine query is precise. When a person looks for services they adopt precise language to be directed to the most relevant results. To cash in on voice search optimization you have to make sure that your services have been optimized for local search. First to be highlighted in the local search engine results add your website to the Google My Business Pages. Your business address that is in sync to your website and local directories. Be consistent and use your full NAP details across all the pages of your website. For citation on other websites use the same NAP details. To add your NAP details in footer of the website just replace the bold content with your respective details. Add reviews of your local customers on your website and optimize your page accordingly. 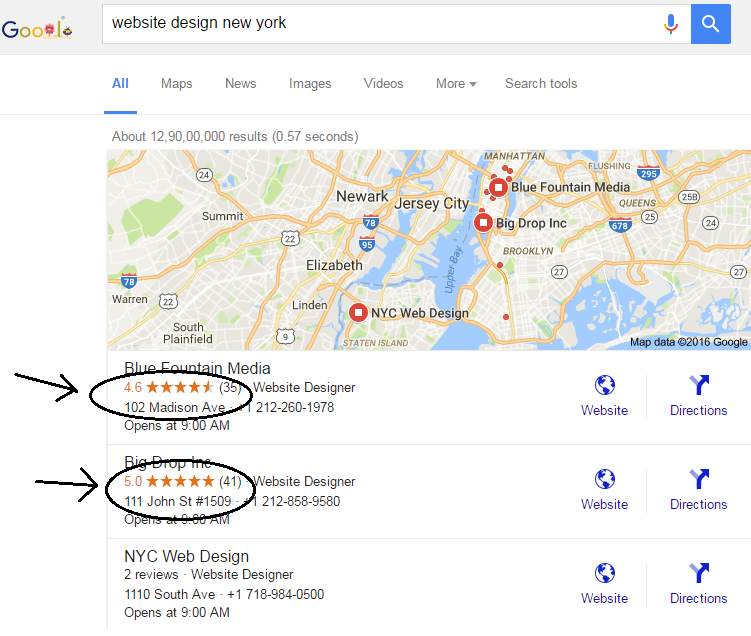 A localized search for “website design new York” on Google yields localized results on top of search engine results. You can see in the screenshot below how effectively the companies have optimized their website for local searches with appropriate NAP and local reviews. So, now when a user asks for specific services in local region you can be rest assured that your website optimized with local SEO will feature in the voice search results. 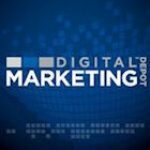 Voice Search optimization can be attributed as a byproduct of smart phone technology. You have to have multiple platform compatible website. Responsive Website design is the process where in your website adapts to the requirements of your user’s device. Not only does a responsive website layout get preference by Search engine algorithm but is a necessity in present times to keep level with your competitors. Responsive Web design uses Fluid, proportion based grids, Flexible images, Varying CSS style rules to cater to the different audience while maintaining same HTML and URL structure. Voice search engine tools like “ok Google” or “Siri” give preference to websites with responsive web pages as they get ranked higher on search engine results. So, next time a user searches for services with voice search engine you have to be ready with a Responsive website layout to get hold of that potential client. The sole aim of Accelerated Mobile Page project is to provide a perfect user friendly atmosphere for mobile audience. 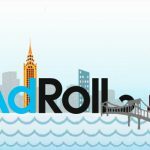 Accelerated Mobile Pages is just what your e-commerce business needs to appeal to the voice search audience. Voice search along with AMP can amplify customer satisfaction by reasonable margins. Once you design Amp pages for your website a user can access the information in quick time as there are no ads, unnecessary images only concise set of information relevant to user query. AMP HTML: It is basically a redundant form of HTML along with some extensions to develop rich content. AMP JS: AMP JS ensures that AMP HTML pages are accessed within instant. Google AMP Cache: The cached AMP HTM pages are accessed with this. How to create AMP HTML Page? Start with the doctype <!doctype html>. Contain <head> and <body> tags (They are optional in HTML). Contain a tag inside their head that points to the regular HTML version of the AMP HTML document or to itself if no such HTML version exists. Contain a tag as the first child of their head tag. Contain a tag inside their head tag. It’s also recommended to include initial-scale=1. Contain a tag as the last element in their head (this includes and loads the AMP JS library). Copy the below code to a file and save it with “.html” extension to get started with your first AMP page. It all boils down to how efficient your website is to adapt to the requirements of voice search engine. AMP pages are vital for any e-commerce business to take advantage of micro moments so as to better their rivals. The micro moments in the buying process of a customer are essential to cash in on any voice search engine enquiry. Your chances of getting noticed by voice search engine enhance significantly with Schema mark up. Schema mark up code is basically semantic vocabulary which helps search engine provide its users with informative results. “example” no longer remains a vague keyword rather becomes more impressive for search engine to rank it on the result pages. You will find the list of data to select your choice of options. For this article let’s choose “Articles”. Add the desired page or article URL which you want to mark-up. In case of HTML pages you can directly paste that and then click on “Start Tagging”. You will be directed to “tag Data” page for tagging items. The page you add for mark-up will be displayed in the left pane and on the right pane the data items are displayed. Since the mark-up here is an article we are going to highlight the name of the title and add “Name” markup which you can see on the top of the list. It gets added to the “data Items” in the right panel. 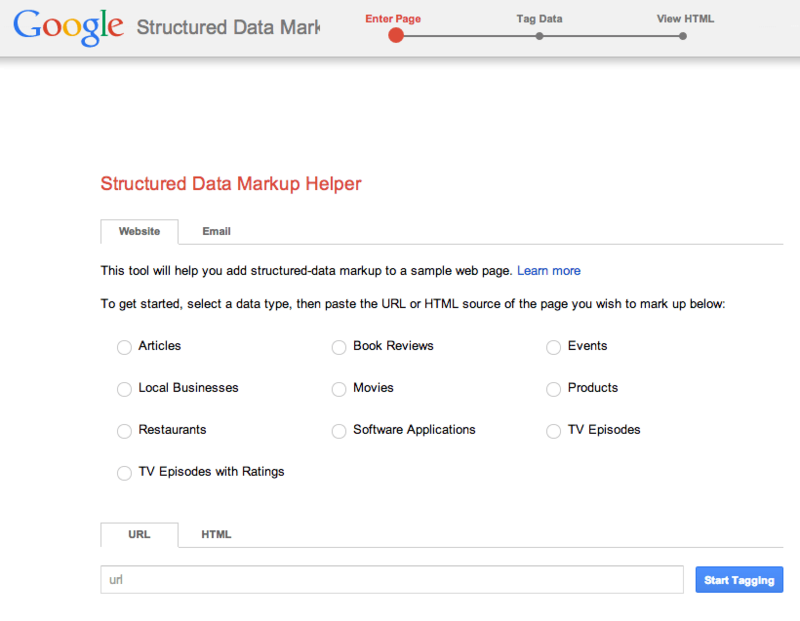 You can use the other mentioned data items for reference to add it up in your mark –up. Choose the most relevant as you won’t be able to add all the ones on the list. After you are done adding relevant mark ups it is time to create HTML. Click on the option of “Create HTML”. 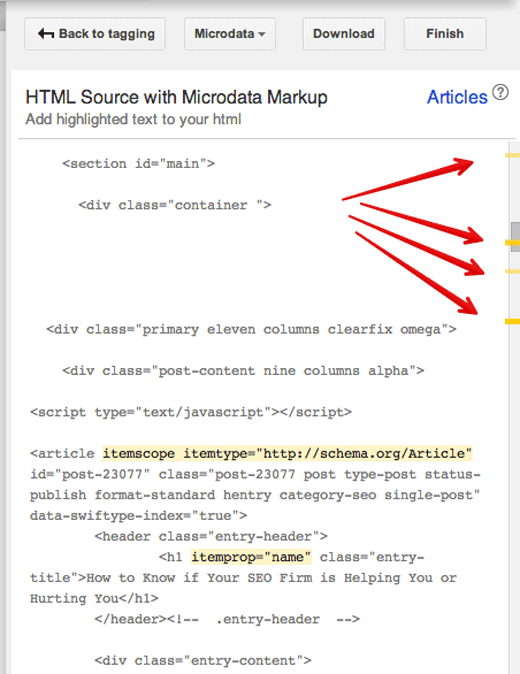 The other simple alternative to add schema mark up on the web page is to download the automatically generated HTML file and then copy/paste in your CMS or source code. Click on Finish option which you can find on the right side of “Download” option. The sole aim of optimizing your content with Schema mark up is to let the voice search engine direct the users to their precise query. Voice search engine has got futuristic appeal to it and with time will only get more advanced. It integrates the concept of user friendly interface with the advancements in technology with comparative ease. The ideal approach for conversions with voice search would be follow step by step instructions as mentioned in the article above. Be it long tail keywords, schema markup or designing a responsive website for Omni channel presence, voice search optimization makes it easy for users to look for information and with above mentioned steps you just have to make sure you are there to act on their voice search query.